I’m an abstract painter engaged in a process with materials. My paintings are created using ready made felt, urethane and industrial pigments that I work on simultaneously and build up into stacks. Experimentation and impulse are at the center of my studio practice. Multiple layers are recycled over time, covered over, cut and restored. My process is like the complexity of sifting through time, generating and regenerating a language that is alive today, yet carries whispers of past painting languages. One continual thread in my work is the overlap between painting and sculptural surfaces. I soak and pour industrial materials onto the surface of fabrics and ready made felt acting in response to how the pigments push through the fibers and collect creases, folds, fissures, and textures. I often install my paintings embedded within the architecture affixed to ceilings, beams, doorways and ledges changing the viewer’s relationship to the objects and the environment. 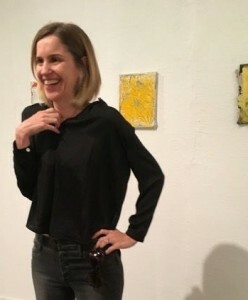 Amy Green received her BFA in painting at the University of Tennessee in 1995 and her MFA from the California Institute of the Arts (CalArts) in 1997. Her paintings and installations have been shown nationally and internationally. Exhibitions include Rolf Ricke Galerie in Cologne and the Neues Museum in Nurnberg, Galerie Karin Friebe, Mannheim, Germany, Galerie Monika Reitz, Frankfurt and Kunstverein St. Gallen Art Museum in Switzerland, Evelyne Canus Gallery, Paris, Cirrus and Susanne Vielmetter in Los Angeles and Cohan Leslie and Browne in New York, among other venues. Reviews include New York Arts Magazine, Art Issues, the Basel Art Fair Catalogue and artnet. Amy Green is represented by Galerie Schmidt Maczollek in Germany.